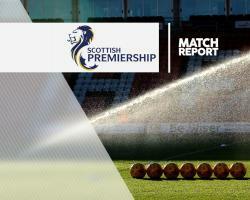 Celtic extended their near-perfect record in the Ladbrokes Premiership with comfortable 3-0 win over Inverness at Parkhead. Winger Scott Sinclair opened the scoring in the 48th minute before striker Leigh Griffiths, making his first start in more than two months, made it 2-0 from close range in the 64th minute. Caley Thistle midfielder Greg Tansey, booked just before the break for one too many infringements, was sent off by referee Crawford Allan for fouling Callum McGregor in the build to the second goal. The visitors, the only team to have taken points off Celtic in the league this season with their 2-2 draw back in September, lost a third to substitute Tom Rogic in the 83rd minute as the leaders made it to 10 wins and one draw in 11 fixtures to go 10 points clear of Aberdeen with a game in hand. One possible downside of the afternoon from a Celtic and Scotland perspective was that skipper Scott Brown - back from international retirement for Scotland's World Cup qualifier against England at Wembley on Friday night - went off with what looked like an injury just after the hour-mark. Brendan Rodgers' side signed off before the international break, however, in commanding position with the Betfred Cup final against the Dons to look forward to later in the month. After recovering from the virus that kept him out of the 1-1 Champions League draw against Borussia Monchengladbach on Tuesday night, Griffiths paired up with Moussa Dembele as McGregor, Patrick Roberts and Jozo Simunovic also came in with Cristian Gamboa, Emilio Izaguirre, Tom Rogic and James Forrest dropping to the bench. Number one Inverness keeper Owain Fon Williams returned at the expense of Cameron Mackay with Lewis Horner and Billy King also coming in for the injured duo Carl Tremarco and Aaron Doran. The home side started with three at the back but had to change back to a four in the 13th minute when Mikael Lustig limped off following a strong challenge by Caley Thistle defender Josh Meekings, left-back Izaguirre coming on and Stuart Armstrong dropping back to right-back. Celtic sprang into life only after Hoops keeper Craig Gordon saved a Ross Draper header. Fon Williams made a fine save from Griffiths' close-range volley by tipping the ball over the bar before Dembele just failed to reach a Roberts' cut-back six yards out. Armstrong, however, should have given the home side the lead in the 35th minute when Izaguirre planted a cross on to his head but the former Dundee United midfielder headed well wide from 12 yards. Sinclair ended the first-half by skying the ball over from around the same distance after weaving his way into the penalty area. However, three minutes after the break he was more accurate when McGregor sent him racing into the box, firing low past Fon William from 14 yards for his 10th of the season. The goal allowed Celtic to relax and Griffiths, McGregor and Brown all had efforts on goal within minutes of the opener. Inverness dropped further back as the champions pressed with purpose. In the 61st minute there was some concern when Brown, the Parkhead side's best player this season, was replaced by Nir Bitton and the Scotland skipper did not appear to be moving freely as he came off. Three minutes later, Griffiths clinched the points when he tapped in from a few yards out after Fon William parried Dembele's drive, with referee Allan racing back to deal with Tansey who had crunched McGregor seconds earlier. Celtic pounded the visitors thereafter and from 16 yards Rogic, who had replaced Dembele in the 70th minute, drove in from Armstrong's cut-back for number three with Inverness fortunate to leave without suffering further pain.